We are pleased to announce that our electronic resources can now be integrated with OneLog, ResearchMonitor, and LookUp Precision implementations. This new functionality enables member libraries to track the firm’s usage of NYLI’s e-resources as well as automatically log in users without necessitating that they sign in daily. Please find detailed instructions below. The first thing you’ll want to do is add NYLI as a new “Managed Resource”. You can do this by searching for the ‘NYLI’ in the “Add Managed Resource” section. 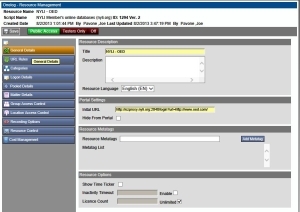 The script ID is 1294 and the name is “NYLI Member’s online databases (nyli.org)” – See screenshot to the left. Search for NYLI Managed Resource and select the script with the ID 1294. In the “General Details” section…Change the name from “NYLI Member’s online databases” to one that reflects the database you’d like to track/log into such as NYLI-OED. See screenshot to the left. Also in the “General Details” section…Change the initial URL to go to our address for that resource. (See list of URLs below to add for each of our databases). In the “URL Rules” section…Add URL for our database. (See screenshot to the left). ResearchMonitor has added NYLI’s resources to their default configuration, so existing users of RM and NYLI will now have it installed in their system. To be sure, or for users that are new to either RM or NYLI, go to the “Resource Updates” section of your configuration and search for the Resource – NYLI – as in the screenshot to the left. Install the resource if it has not been installed already. The first thing you’ll want to do is contact LookUp Precision Client Services and request the NYLI filter package. You will receive a disk file named nyli.filter_data_v2 to put on your LookUp Precision server. Select the disk file (nyli.filter_data_v2). Make sure the “enabled” checkbox next to each “NYLI” filter is checked for any of the databases you’d like to include. Finally, in the Filter Editor, click the Publish button to distribute the modified filter set to all of your users.